It’s that time of the year again – New Year’s is coming up which means New Year’s resolutions. However, according to U.S. news, 80% of people give up on their resolutions by the second week of February. So to help you avoid being one of them, here are some tips on how to set smart fitness goals for the New Year. Many people choose to use the New Year as a way to completely overhaul their lifestyle. They want to lose weight, bulk up, cut out sugar, workout 5 times a week and the list goes on. And this is just fitness goals! This is why it is so easy for people to fall off the wagon; there are just too many goals to keep track of with so many changes to make. By scattering your focus among many, you can’t channel your full effort into them. So one of the tips on how to set smart fitness goals for the New Year is to focus only on a couple of fitness goals. This way, you can really put 100% into them and be able to maintain them for longer. It is better to make progress with fewer goals than none at all with many. S for Specific – Make sure that you clearly define your fitness goal. Vague goals do not give you enough direction; you need to know exactly what you want in the end and make it clear on when you can say, you did it. For example, don’t say I want to lose weight or I want to gain muscle but I will lose 5lbs or I will gain 2 kgs of muscle mass by doing x, y, and z.
M for Measurable – Your fitness goal needs to be something that you can actively track. Break down your big goal into smaller, measurable goals. E.g. I will lose 1lb by week 4. I will lose another 2 lbs by week 8. A for Attainable – Do you have the time, money, resources to achieve this goal? If you set a goal that is not attainable, you risk demoralizing yourself. E.g. Do you have the time to work out? Can you afford a gym membership or personal training? Do you have the time to set up a home gym? Adjust your goals accordingly so that you will be able to attain it in the end. R for Realistic and Relevant – Don’t set yourself up for failure. While your goal should challenge you, it should also be realistic and achievable. It should also be relevant to you. Is your goal aligned with your life and direction you want it to take? If you are not interested in weight loss but would rather build muscle, then set that as your goal. Otherwise, you won’t have the motivation or discipline to see it through. T for Time – When do you want to achieve it by? Give yourself enough time to realistically achieve it but not too much time because then there won’t be a sense of urgency. E.g. I will lose 5lbs in 6 months. Another tip on how to set smart fitness goals for the New Year is to write it down. Something about having your goal written down on paper in tangible form makes it more permanent and real. Place these papers somewhere you will see every day such as above your desk at work or home, or on your bedroom door so you can be reminded every day and use each day as an opportunity to make progress. Also, pay attention to the words you use. Use words like “will” to create a sense of determination and positivity. E.g. I will lose 5lbs in 6 months instead of “I want to”. If you want to know how to set smart fitness goals for the New Year, then also write down an action plan, including your S.M.A.R.T guidelines, a timeline and the smaller measurable goals. This will not only give you a direction but a plan to follow. It will also be really motivating being able to track your progress and tick things off as you go. 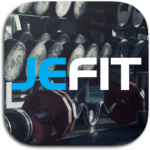 Jefit is a gym workout app that helps all gym goers and athletes keep on track with their fitness goals. Not only does it you the ability to update and share your workout log with the supportive community, it has the largest exercise library that covers both weight training and cardio. If you have a smart fitness goal for the New Year, why not get Jefit to help you keep on track? What are your fitness goals for 2018? Let us know in the comments below, we would love to know!